Another great little 'micro DAW', SynthStation has plenty to keep you interested. Deeper than it looks. 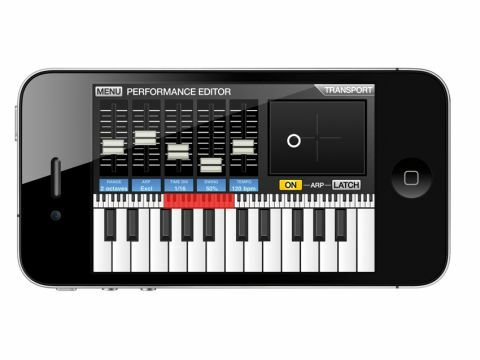 Integrates seamlessly with the SynthStation 25. Synth editing can be a faff. SynthStation is essentially a sequencer containing three synth layers and a drum machine. Each synth can load a different patch, while the drum machine offers about 50 kits to choose from. Each synth and/or drum sound is triggered via the built-in sequencer and the output recorded to a WAV and transferred via WiFi. While the premise is based around three synths and a beat, though, there's a lot more to SynthStation than meets the eye. When you launch the app, you're met with a 4x3 grid offering access to a dozen screens - our fave is definitely the X/Y pad. This enables you to 'bounce' a ball around the screen, which controls filter cutoff on the X axis and resonance on the Y axis, affecting the currently selected synth or drum kit. This is a great example of utilising touchscreen functionality in a way that caters well to a smaller display (we tested it on an iPhone 4). The Drum Kit section offers nine drum pads, while the Tap Tempo function will take care of any syncing. The synth presets are all very modern and 'digital', but with the comprehensive synth editing functions, they can be shaped to your needs, albeit with a bit of faffing around. Each drum sound can be panned and pitched, with some serious digital artefacts at tuning extremes, but this is actually quite endearing and could be used as a special effect. All in all, the depth of SynthStation can't be overstated. It can be as involved or as shallow as you need it to be. While it's essentially a sequencer and sound palette, it has plenty of potential as a live performance tool. Add in the functionality of the SynthStation 25 keyboard and you've got something quite special.